Irvine, Calif. is a high-tech economic powerhouse sometimes referred to as “Silicon Valley South.” This fast-growing city’s skyline was transformed by a pair of distinctive glass office towers located at Irvine’s Spectrum Center, an open-air retail and dining district. 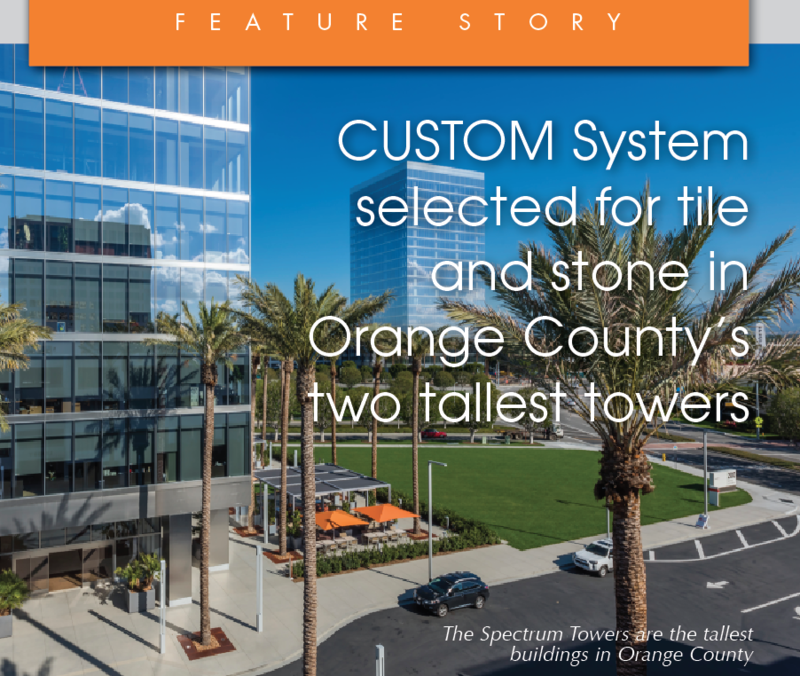 Each 323-foot tower creates a vertical business campus offering impressive 360-degree views of coastal Orange County and showcasing large-format tile and stone on every floor. Both tile contractors on this project used a Build Green® Emerald System™ of products from CUSTOM to prep, set, grout and seal the assemblies and contribute to expected LEED Gold certification. 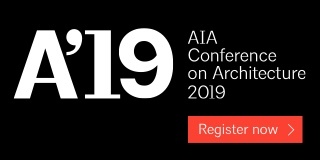 Pei Cobb Freed & Partners, the architecture firm behind the Louvre’s iconic glass pyramid, designed the Spectrum Center’s new glass-walled, 426,000-sq.-ft. towers. Curtain wall construction creates an open, contemporary lobby to welcome employees and visitors to the many corporate offices headquartered here, including Mazda’s North American Operations. This effect is enhanced by the luxurious expanse of oversized natural stone on floors, walls and even inside the elevator cabs. Two long-time, family-owned, Southern California firms executed the tile and stone work at the Spectrum Towers. A team from NTCA member company Charles McCandless Tile of Santa Ana set 30,000 sq. 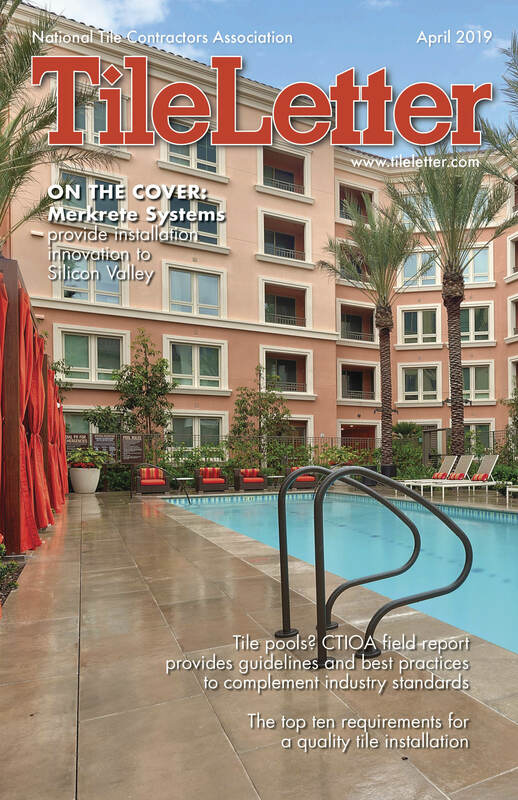 ft. of porcelain and Carnevale and Lohr of Bell Gardens installed 20,000 sq. ft. of 3/4” thick quartzite pavers. Prior to beginning work, samples of the very dense natural stone were submitted to CUSTOM’s laboratory for product testing. 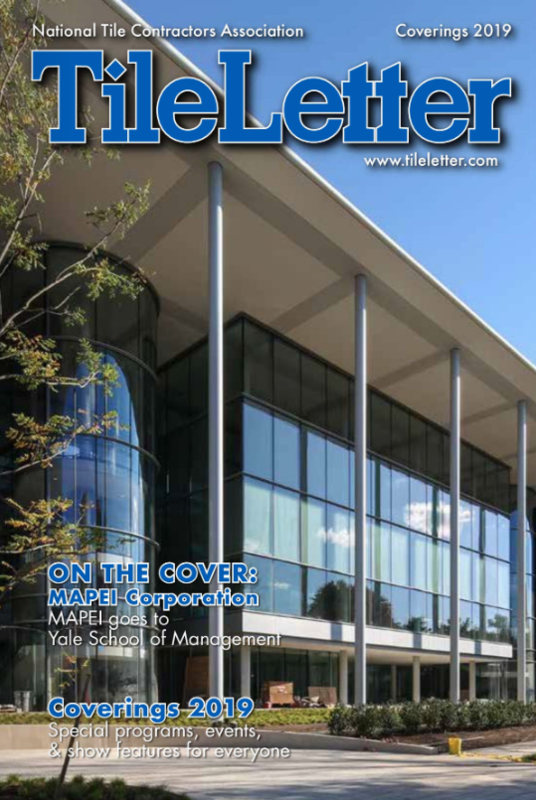 Based on their findings, the technicians recommended using ProLite® Premium Large Format Tile Mortar, which was then selected to install all tile and stone materials throughout the project. 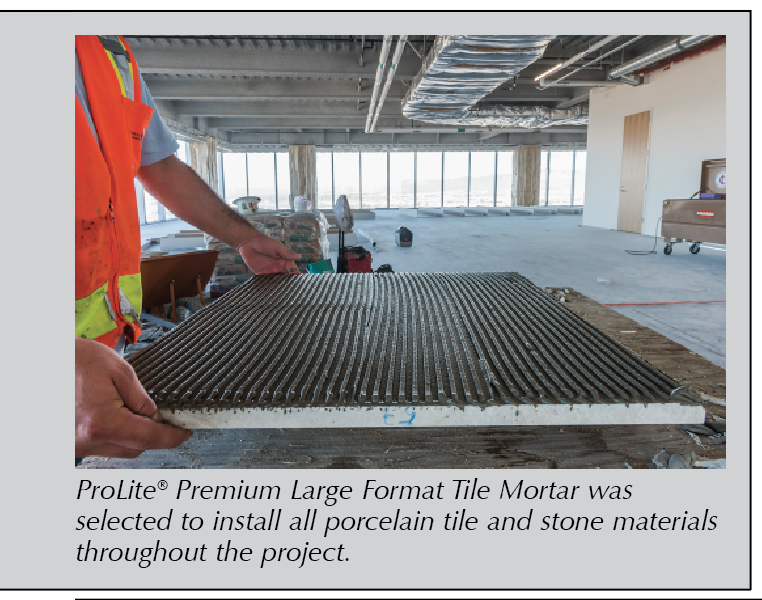 ProLite is a versatile, polymer-modified, dry-set mortar for large-and-heavy tiles that provides excellent bond strength. This mortar exceeds ANSI A118.15 TE and will not slump on floors or sag on walls. ProLite is formulated with lightweight, recycled aggregate, so it weighs 40% less than other mortars. Environmentally sustainable content delivers superior handling characteristics and also makes ProLite easier to carry and mix on the jobsite. A 30 lb. bag of ProLite typically covers the same area as 50 lbs. of traditional mortar. 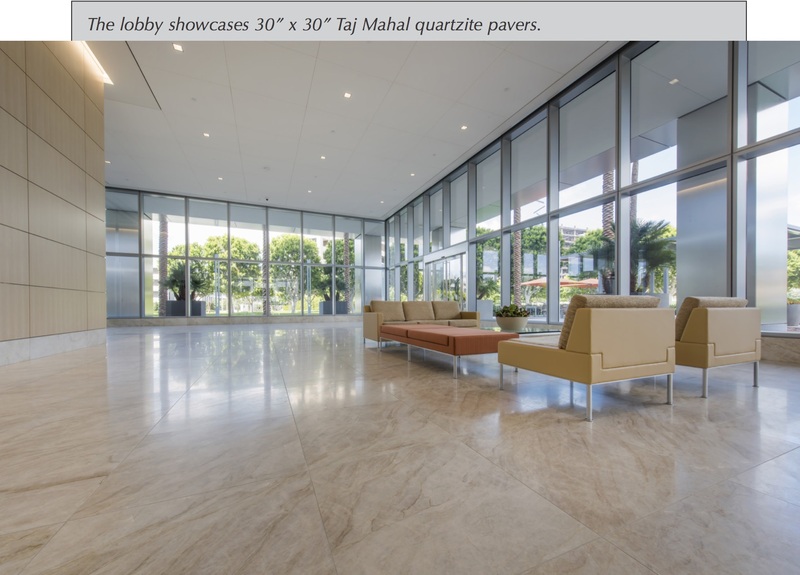 Craftsmen from Carnevale and Lohr fabricated and set 30” x 30” Taj Mahal quartzite pavers in the ground floor lobby using a dry-pack method including ProLite® as the bonding mortar. 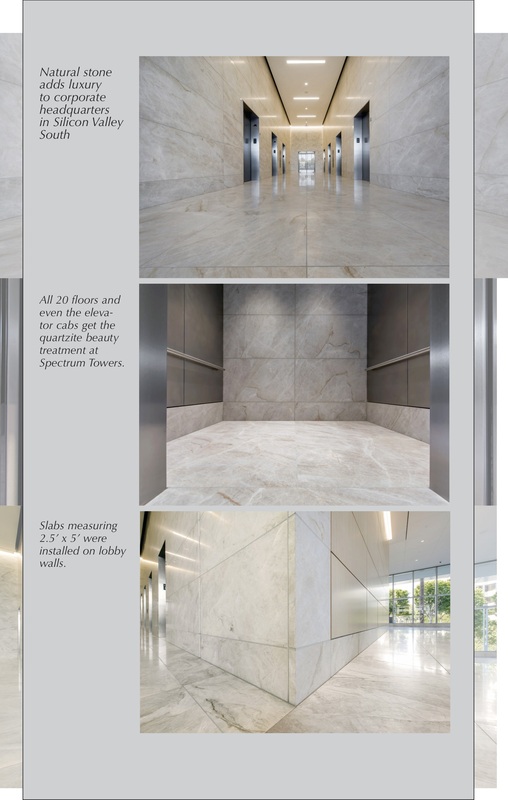 Matching material measuring 2.5’ x 5’ was mechanically anchored on lobby walls and 20 stories of tower lobby floors were set with the quartzite in a 24” x 24” format. “ProLite is our number one choice,” said Jim Lunn, foreman at Carnevale and Lohr. “The guys in the field really like using it, especially for walls. The workability without sag is phenomenal. The pot life of ProLite is great and being lightweight is also a big plus,” he added. After application of RedGard, bathroom floors were set with 12” x 12” Spec Ceramics Space Taupe matte tile. The porcelain tile installed on the walls was 12” x 24” Pure White matte supplied by Emser. Soft joints at changes of plane were filled with PolyBlend® Ceramic Tile Caulk which is suitable for use in interior, intermittently wet areas like these commercial buildings’ restrooms. All porcelain and natural stone tile throughout both towers was grouted with Prism® Ultimate Performance Grout in shades to complement the materials for a modern, monolithic look. 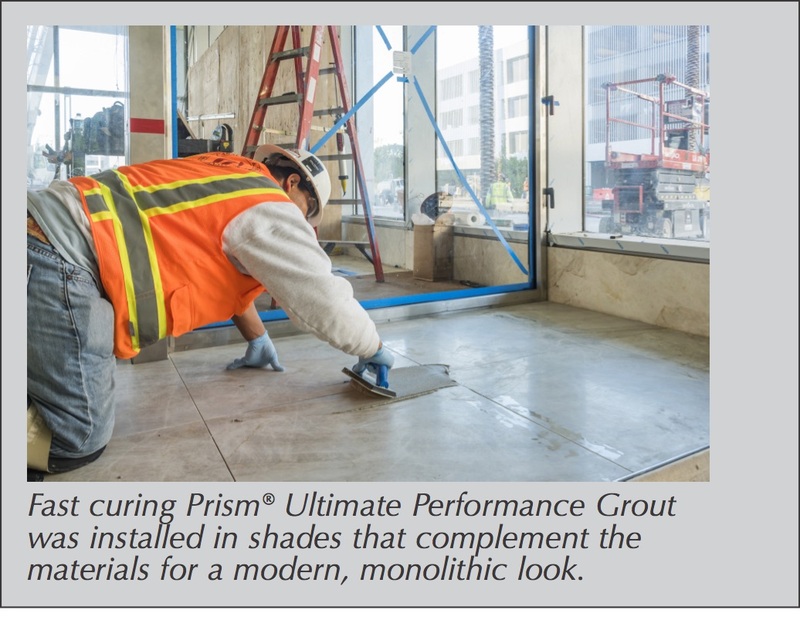 Fast-setting, lightweight Prism sets a new standard in grout technology. 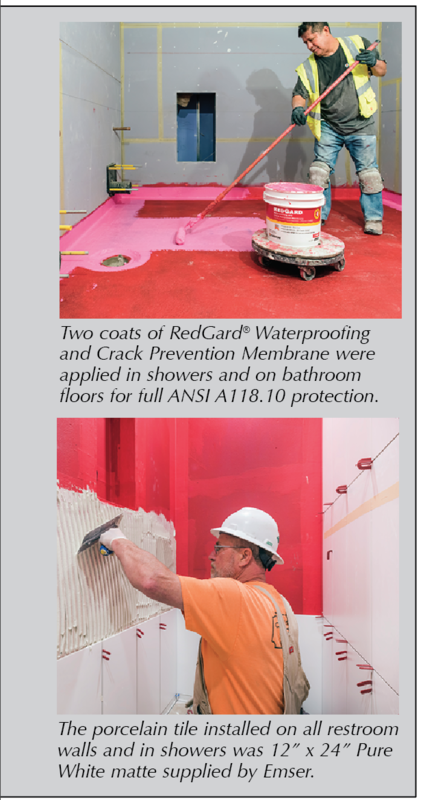 This calcium aluminate-based formula meets ANSI A118.17 high performance standards and will not contribute to efflorescence. 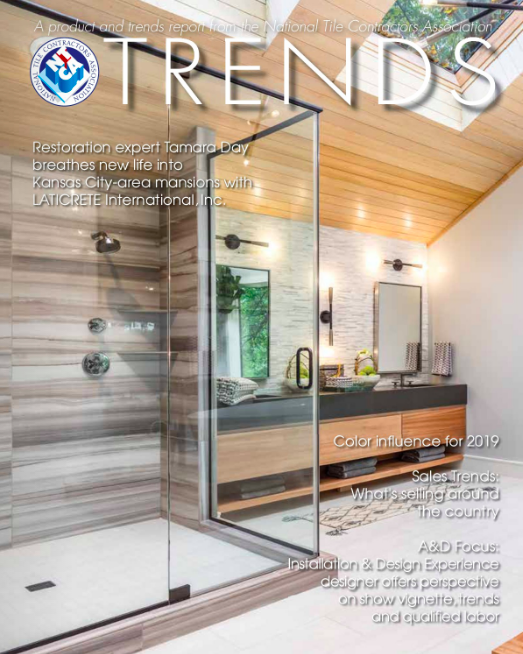 Prism demonstrates uniform, consistent color without mottling or shading, regardless of tile type or variable weather conditions such as humidity. These reliable results were important based on fluctuating environmental conditions at the jobsite due to the height of the towers and the effect of all-glass walls. Recycled aggregate content makes Prism 30% lighter than other grouts and delivers superior, smooth handling in grout joints as narrow as 1/16”.